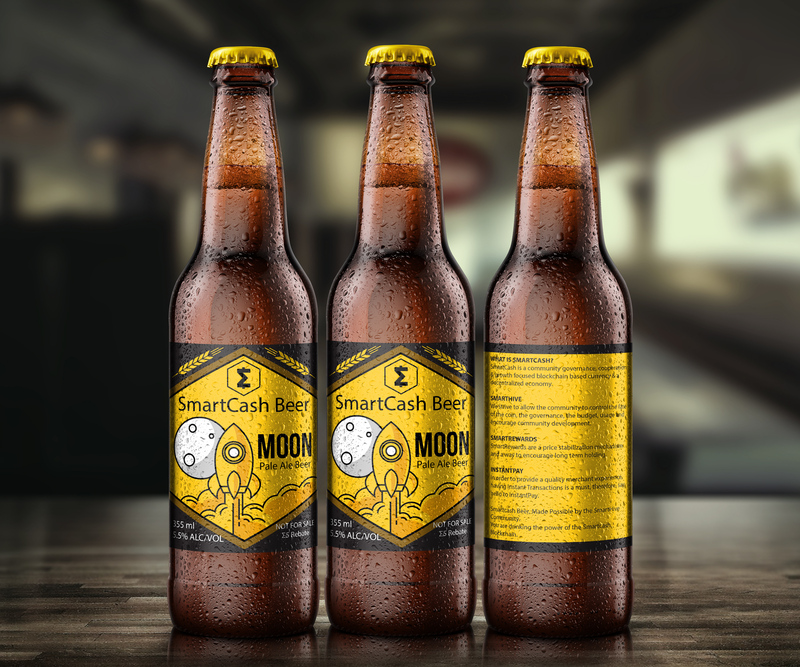 We are professional craft beer brewers and we'll create the first Crypto Beer: SmarcashBeer and we'll focus in Smartcash adoption and we'll concentrate in building a community around Smartcash. We are tech people and Smartcash investors and promoters, but also we are professional craft beer brewers, me @juanjo2012 ,@antonio, and@aabonce we also have an ecommerce site, where we sell everything to brew beer across all Mexico. And we have long experience distributing and brewing beer. I don’t want to focus in our beer experience, but with 10 years in the business, we really know what we are talking about. We want to create the first crypto beer, the Smartcash Beer. We are doing this because it puts together our two deep passions, Cryptocurrencies and Beer. We really want to focus in Smartcash adoption, but so far, apart from flyers, stickers or T-shirts, we don’t find a real product created by the Smartcash community. Step 1: We'll brew 100 boxes of 24 beers of a delicious Pale Ale to start up, maybe we can add other kinds of beer, a wheat beer, a porter beer or other styles in the future in case we and the community want to extend this proposal. The beer is going to have a nice label design with the Smartcash logo, the beer information(AVB %, Style: Pale Ale Beer, etc) and the legend “Not for Sale” and the legend (Smart)2 Give Away and the legend, limited to 1 beer per client. So the beer is free, and if you get it you’ll get 2 Smarts. The back part of the label also states the main information about Smartcash. Step 2: We’d distribute some of the beer with the Smarcash communities in Mexico, so far in Guadalajara and Cancun, and we’ll distribute the rest in local bars in Queretaro and Cancun where we have local presence. The beer will be free, we won’t charge a dime to any restaurant or bar, because is already paid by the SmartHive budget, that’s why the beer will have the legend “Not for Sale”, we’ll give the beer for free but we’ll ask the businesses to put a Sticker with the “Smartcash Accepted Here” legend, and we’ll teach them everything about Smartcash, explain them its features and the benefits of staking Smartcash, there will be 2 Smarts per beer as a give away. People will have to publish their Smarcash address in the Spanish Telegram group, so we'll send them 2 Smarts. This way, we'll have restaurants and bars accepting Smartcash, we'll get people(consumers) that will learn about Smartcash, they will install a wallet, and they will receive 2 Smarts. We’ll encourage the bars and restaurants to promote that they have free Smartcash beer in their business in social media platforms, so they can attract more clients, they benefit, the end consumer benefits and more and more people will know and use Smartcash, more wallets and the community grows. We think this is a great way, that people can see(and drink) the real power of Smartcash. We’ll print flyers and stickers and publish in Steemit in English and Spanish a report of what we are doing and the business participating, we might record videos in the bars with people drinking Smartcash and showing their wallets. There’s a big an important Beer expo(Cerveza Mexico) and Beer Contest in Mexico in October, and who knows, we'll get our Smartcash beer into the competition. The first cryptobeer in a contest. Copa Cerveza Mexico It has widely press coverage. I’m sure Smartcash beerm the first Crypto beer, it will get the media attention. Timeframe: We need 22 days to brew beer and have it ready. Yes it takes so long, it's high quality craft beer, fermented 3 weeks, and some styles could take much longer. While the beer is fermenting, we'll print the boxes, flyers and labels we need. We'll bottle the beer in a day, and we'll start the Smartcash evangelization with our promotional beer, next day. So, once we have our Smartcash brews, we'll distribute them and we'll talk with the restaurants and bars, so they can start accepting Smartcash,and put the "Smartcash accepted here" in their windows. We are planning to do this during 3 weeks. We have experience distributing beers and we know many bars and restaurants owners. People will start joining the telegram group and publishing their wallet address so they can receive 2 Smarts. Once people knows about Smartcash, joined the telegram group and have Smartcash in their wallets, many of them will get more interested. We'll report our actions bothn in the telegram group and in Steemit. Why just don't sell the beer instead of giving it for free? We won't sell the beer because it's not a bussiness, beer it's a promotional product and I think it could gain media attention. The Smarthive and community budget will pay for the beer. And We'll give it for free, but people will have to download a wallet and undertand how Smartcash works. If we sell the beer it's harder to ask people to learn about a crypto-what?. They paid for the beer, so they want to be bothered. There's a 5 Smarts Give away. What will do if some Smarts are not claimed? In order to claim Smarts people will have to publish their address in the telegram group. So the community will know if we have Smarts left, and we think will do. So we'll set a date of 8 weeks to claim your Smarts. After that period of time, we'll convert the Smarts to Fiat and we'll give goods behalf Smartcash Global Community to a Charity Institution. We'll take pictures and report it in Telegram and Steemit. You want to know mor about us? I’m @juanjo2012, I’m computer’s engineer and I’m so passionate about the technology, but I’m also a beer brewer and I co-founded an e-commerce(I love e-commerce) website to sell everything to brew beer at a small scale(brewmasters.com.mx). I also own other small businesses. Iif you lookmfor me on google maybe you find some magazone articles. You can search for Juan Jose Hyatt Ziva. I was brewing in Hyat Ziva Cancun for 2 years. I live half of the time in Queretaro and the other half of the time in Cancun, Mexico. I was involved in the creation of the Queretaro Technology Association of IT Companies, Universities and Fed and State Government. So I know the IT sector very well. I’m juanjo2012, because 2012 was the year when I discovered blockchain and cryptocurrencies. I think smartcash is one of the most promising coins, I really like that is a community centered cryptocurrency and it's one of my 3 top cryptoassets. I’m @aabonce, I’m a journalist writer and photographer, I’m oriented to the IT sector and Business development sector, I’m also a beer brewer and I deliver training in how to brew. I’ve lived in Queretaro my whole life and I’ve seen the IT growing at a very fast rate. I love to write, I love technology, I love the blockchain and I love the Smartcash model. I’m @antonio, I work in the Faculty of Engineering at University of Queretaro, in the financial sector. I bought my first cryptocurrencies in 2013. I’m very connected to the Academic sector and Financial sector in Queretaro. I promoted the first encounter of Blockchain Technologies in the University, we had 200 attendees. I know that cryptocurrencies are the future and my goal is to contribute to the mass adoption of Smartcash as a real mean of payment. Also I brew beer and pilot little airplanes. So We are a strong and interdisciplinary team with several years of experience in cryptocurrencies, tight together for the commitment of creating a strong Smartcash community in adequate environment. YYYYEEESSS!!!! I got some ideas brewing to get this started around my city, We have a lot of small business restaurant/bars near by. Honestly great idea hope this happens. Also how can we get some plz I would love to drink Smartcash beer!!! Hello @KingKoing, I'm sure this is a special and unique way to demonstrate the power of Smartcash. We are working hard to build a community around smartcash.